Originally forested land had been cleared for farming and lumber use in the 1700s and 1800s. Greater erosion rates and poor soil composition were affected by such practices before the Wayne National Forest, a portion pictured here, was created in reforestation efforts. PEDRO – The Wayne National Forest is seeking public feedback by Tuesday, May 1, 2018, on a proposal that would promote the regeneration of oak and hickory forest on the Ironton Ranger District in southeast Ohio. The project, called The Sunny Oaks Project, is located east of State Route 93, west of State Route 141, north of the community of Aid and south of the community of Oak Hill. The project area is located in parts of Jackson, Gallia, and Lawrence Counties. If approved, the proposal would authorize the harvest of about 2,900 acres of forest through a mix of clearcut and shelterwood harvests. These harvest types are designed to favor oak and hickory forest regeneration, especially when they are combined with other “timber stand improvement” (TSI) treatments. TSI treatments included in this proposal are prescribed fire, manual girdling/felling of competing trees, and herbicide treatment of competing trees. Prescribed fire would occur on 2,000-4,000 acres per year across the 25,000 acre project area. Natural re-growth could be supplemented with planted trees. 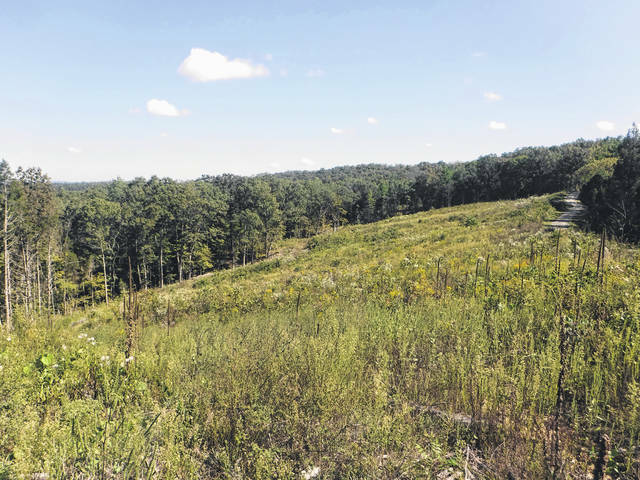 Around 1,000 acres of forest would be harvested in Gallia, predominantly in Greenfield Township and some in Perry Township. “Our goal is to create a young brushy forest that provides valuable cover and food for a great variety of wildlife species, such as the blue-winged warbler, eastern box turtle, woodcock, bobwhite quail, ruffed grouse, black bear, eastern cottontail, red fox, timber rattlesnakes, and various pollinator species,” said the Wayne National Forest Environmental Coordinator, Rachel Orwan. Under the proposal, plant species, such as Carolina thistle, wild pea, pale beardtongue, fern-leaf false foxglove, plain gentian, small white snakeroot, Sampson’s snakeroot, and white fringetree would also benefit. Orwan said to meet the habitat goals of the forest, trees are occasionally cleared to promote new growth as some animals naturally live in younger parts of a forest while other animals live in older. With many of the trees in the forest having aged at the same rate due to the creation circumstances of the Wayne National Forest, the program seeks to create age variation in the forest as well as further oak and hickory growth. That also means promoting a diversity of habitat for a variety of animals. Money raised from the sale of timber will in part go back to the local counties the forest resides within. Orwan said county government would distribute the funding but it would go to school districts and other such programs. Part of reaching the habitat goals of the forest also means having a “product that is financially beneficial” to harvesters for the forest to reach those goals, according to Orwan. She encouraged members of the public with questions and concerns to reach out. This proposal includes timber harvest that would create a number of temporary clearings. Some of these would be greater than 40 acres in size. The National Forest Management Act (36 CFR 219) allows temporary clearings greater than 40 acres, provided that the public is given 60 days’ notice and the regional forester reviews the proposal. These larger harvests are proposed in order to respond to the need to create young brushy forests. This scoping period provides for the first 30 days of the required 60 days’ notice. Following the scoping period an environmental analysis will be completed and made available to the public for a 30-day comment period. If approved, a decision would likely be made in the fall of 2018, with timber harvests and timber stand improvement treatments to occur over the next 10-20 years. Public comments can be made to Rachel Orwan at Wayne National Forest, Ironton Ranger District, 6518 State Route 93, Pedro, Ohio 45659 by Tuesday, May 1, 2018, specifically stating that they are in reference to the scoping period for The Sunny Oaks Project. Comments should directly relate the proposed action to a resource impact. Include your name, current physical mailing address, phone number and signature or other verification of identity with your comments. Residents may also call to discuss this project at (740) 753-0101 during normal business hours (Monday through Friday, 8 a.m. to 4:30 p.m.) or submit comments electronically to: comments-eastern-wayne-ironton@fs.fed.us . Information about this and other projects being developed and analyzed can be found online at the Wayne National Forest website at http://www.fs.usda.gov/projects/wayne/landmanagement/projects . For more information, visit our website at http://www.fs.usda.gov/wayne. Follow the Wayne National Forest on Twitter: @waynenationalfs and Facebook.